Honor Gadget Gift Guide: Step Away from Anything that Wilts and Step up your Smartphone Game this Valentine's Day! February 07, 2019 -Everybody deserves a treat from time to time and what better time than Valentine’s Day to treat your loved one or even yourself. Finding a perfect gift for your Valentine doesn’t get much easier with this gift guide for the tech lover, that has a knack for making fashion statement, in your life. For Valentine's Day, step away from anything that will wilt or spoil after three days, and instead, opt for something a little longer lasting. HONOR, a leading smartphone e-brand, has recently launched its latest flagship smartphone, HONOR View20 in Phantom Red that’s part of a Moschino collaboration with HONOR. The HONOR View20 phone will last more than 11 hours with continuous use – thanks to its 4,000mAh battery - so you’ll never be left short when you need your phone most. Express your love with the world’s first 48MP Camera + TOF 3D Camera, 25MP In-screen front camera with a narrowest 4.5mm opening, 7nm SOC Kirin 980 AI Chipset, Aurora Nano-texture design and the Dual NPU which supports the AI Triple-Antenna Wi-Fi technology with HONOR View20. The phone also packs 25-megapixel front shooter for selfies. HONOR View20’s impressive camera is able to capture an incredible amount of detail to ensure you don’t miss those special moments. It’s designed to enhance landscape images using artificial intelligence (AI), and provide the best big-megapixel photo possible. The phone also uses AI to avoid blur, resulting in bright pictures taken in low light when Night Mode is enabled. The phone, in collaboration with classy, iconic, and luxurious brand Moschino comes with a price tag of AED 2399, is truly a lavish gift that will thrill your loved one. 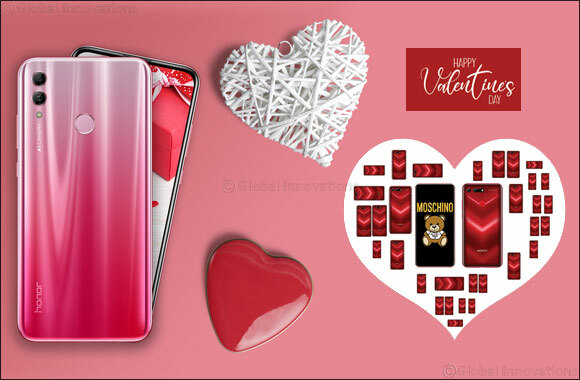 If you’re looking for something a bit more purse-friendly, HONOR has a line of other beautiful phones that are guaranteed to showcase your love to your Valentine: HONOR 10 Lite in Shiny Red and HONOR 8X in Phantom Blue. Featuring a bezel-less display and artistic colors and making heads turn, the latest budget phone, HONOR 10 Lite, released by HONOR has been well received with the millennial crowd and loved for its selfie capabilities, making it the selfie king of budget phones with 24MP front camera and 13MP + 2MP back camera. The HONOR 10 Lite is a flashy device which comes in colors that shimmer in Honor’s classic “Aurora” pattern of a gradient from red to white, called Shiny Red. HONOR 10 Lite is a great phone for those on a tight budget at a price point of AED 799. HONOR 8X, a smartphone as surprising as a gift should be, not only does it have a huge screen, but it also has loads of storage and an amazing AI camera, ideal for taking that perfect selfie -thanks to its 16MP front camera and 20MP back camera. An impressive screen to body ratio, an elegant finish and a stylish design all contribute to the HONOR 8X’s overall looks. However, it’s the colors that really highlight the phone’s beauty as it comes in fabulous, Phantom Blue! HONOR 8X is priced from as little as AED999. In other news, HONOR is kicking off The ‘See The Unseen’ photography challenge supported by Instagram star and travel blogger Jack Morris, the face of the travel blog Do You Travel which has over two million followers; and Murad Osmann, one half of travelling Instagram-couple Murad and Nataly, of the web phenomenon #FollowMeTo. Both Jack and Murad will be campaign mentors and judges during the two-month photo-challenge campaign involving three key themes: ‘Unseen Love’; ‘Unseen Heroes’; and ‘Unseen World’, to encourage HONOR users to discover the countless stories and adventures that surround them wherever they are in the world. Each week during the campaign, mentors Jack and Murad will select the most interesting of the submitted pictures. These will be featured on the HONOR Gallery, a dedicated online photographic community for HONOR smartphone users, and HONOR social channels together with a background story to accompany the shot. Competition entries can win exciting prizes including the latest HONOR View20 smartphones.